As Tian threads the tiny beads onto wire stems she remembers her father and sheds for him a glass tear. 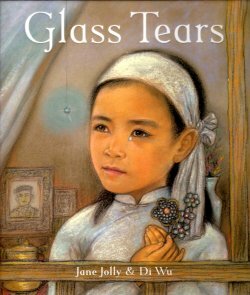 Based on a true event from the 1940's this gentle story by Jane Jolly has been exquisitely illustrated by Di Wu. This sophisticated picture book is more suitable for older readers because it has more complex sentences detailed ideas and harder pictures to understand.